If you read one article about Samaria Gorge, Read this one! Home/Days to Remember/If you read one article about Samaria Gorge, Read this one! Spend a day to hike Samaria Gorge and then swim at Agia Roumeli beach! If you want to add some action in your relaxing vacations it would be a great to visit Samaria Gorge! Especially during Spring of Autumn the weather is the ideal for this escape. You have to wake up relatively early and drive to Chania in order to get the bus to Omalos. The suggested time to get the bus from Chania Bus Station is 6:15 or 7:45 (times might vary so please check the official website of Chania Bus Station). The bus will take you to Omalos where the entrance of the longest trekking gorge in Europe starts. It takes about 5-6 hours to cross the gorge which is about 18 km. The beauty of nature and of the landscape will make it significantly shorter! What is more interesting about Samaria Gorge is the Gates where the two sides of the gorge are just four meters close and soar up to 500 meters. In the gorge you can see a wide variety of flowers and birds as well as the rare goat of Crete named Kri-Kri. The route starts at an altitude of 1,250 meters and it ends after 16 km of hiking in the gorge plus 2 km of walking to reach the small traditional village of Agia Roumeli after the exit of the gorge. Depending on the time you make to cross the gorge you will grab the opportunity and swim in the Libyan Sea. Alternatively you can choose to eat in one of the taverns of the village but I would rather grab something small to eat and enjoy the beach. There you take the boat for the way back as there is no road to connect Agia Roumeli with the north of Crete. The boat departs at around 17:30 and it takes you to the village named Sfakia οr Chora Sfakion (time might vary so please check the official website of the ferry company ANENDYK). There you have to go directly to the local bus station and get the bus to Chania Bus Station. The bus departs at 18:30 but do not worry, there are enough busses for everyone and they wait to get all the passengers coming from the boat. Post Update (1/10/15): There is a chance during autumn or spring the gorge to be closed for the public. If the weather is rainy for safety purposes the local authorities prohibit the entrance. I highly advice you to check it by contacting either the Information Desk of Samaria Gorge at +30 28210 67179. 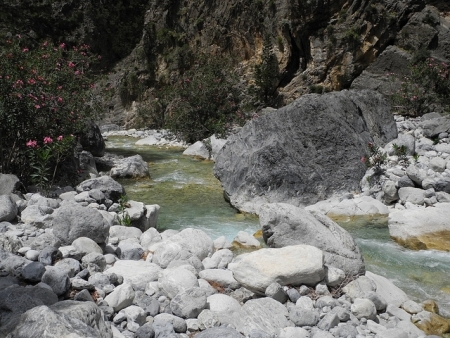 Additionally, to check alone the weather conditions at Samaria Gorge click here.